Find hotel near Taste Burgundy Wine Schoo .. This is the best wine tasting school and wine tours and Christina is the most informative guide and host. She offers private classroom introductory lessons and you will be very satisfied with how much she knows about the city and its taste. Later, she herself will take you along a nice tour of Cote and stop at all important places to tell you about wine making and grape production. She makes all her guests feel very comfortable and she is very humble too while giving all other necessary info about places you can visit. 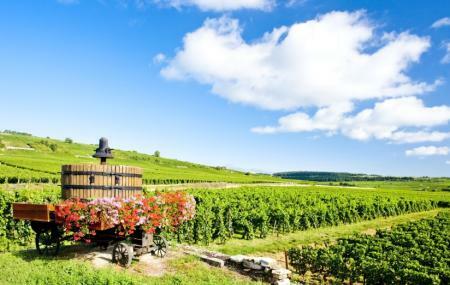 How popular is Taste Burgundy Wine School? People normally club together Patriarche Pere & Fils and Burgundy Evasion Bike Tours while planning their visit to Taste Burgundy Wine School. Prior to booking, I'd read many positive reviews about Cristina Otel and the Burgundy Wine School. Still, the experience substantially exceeded my expectations. Not only is Cristina's depth of knowledge seemingly inexhaustible, but she is skilled in conveying otherwise complex information in ways that are easily digested. Beginning my visit to the Côte d'Or with an orientation at the Burgundy Wine School could not have been a better choice.